Who said air travel has lost its glamour? Let’s be honest: the past twelve months haven’t been a good time for commercial aviation. A string of unsavory headlines; regulatory failures, IT mishaps and a squashed buttercream birthday cake have all contributed to a sense that the airline industry’s brutish business model needs an upgrade. But we’re here to tell you that there’s good news. While travel search engines might prioritize price above everything else, AirHelp Score doesn’t. We value on-time performance, customer service efficiency and quality of service. The things that matter. It is AirHelp’s hope that putting these things first will encourage airlines to reform themselves for the long-suffering paying public. 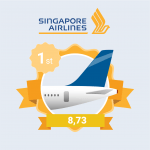 So when we tell you that Singapore Airlines has not only jumped from from 3rd to 1st place in our airline rankings, but that Singapore Airport has also debuted as the premier airport in world travel with a score of 9.07, that’s something to take notice of. The island-city state is the indisputable king of the skies in 2017. Does the airline get you there on time? How well do they handle claims when things go wrong? What do passengers make of the travel experience? Each question gets equal weight, so one third each. The higher the score, the more likely they are to get you to your destination on time, pamper you onboard, and treat you properly if you get delayed, canceled, or overbooked. With a solid customer processing efficiency score, great on-time performance, and a perfect ten for quality of service, Singapore Airlines knocks Qatar Airways off the top spot with a score of 8.73. 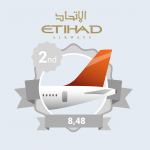 Etihad also gets full marks for quality of service, but is let down by the worst customer service efficiency score of any airline in the top ten. Some focus on how they handle their claims when things go wrong could see them easily claim the top spot. 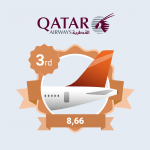 The once untouchable Qatar Airways continues to provide an excellent service, but drops to third in a reshuffling of the elite. Don’t get too comfortable, Singapore Airlines, they’ll be back! In 2017, we wanted to create a benchmark in airport excellence. 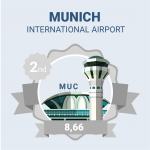 Applying rigorous methodology similar to our airline rankings, AirHelp Score for airports gives you the lowdown on how well the world’s big hubs are delivering for passengers. 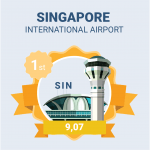 Singapore Airport debuts as the globe’s top airport in world travel with a score of 9.07. It’s quite a coup for Singapore, which now holds the dual crown of best airline and best airline in the world. This will take some beating! 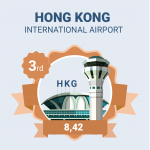 Compared to Shenzhen (6.51), its regional rival on the Chinese mainland, Hong Kong International is miles ahead. There’s competition from European airports though, with Copenhagen Kastrup (8.04) and Helsinki-Vantaa (8.03) both jostling for a place on the podium.